In Luke 5, Jesus taught His followers an important principle about fasting. Religious people of that time would often use fasting as a way to boast about their holiness, thus showing their pride. Jesus taught that fasting should be a private act in which a person shows a right heart before God. 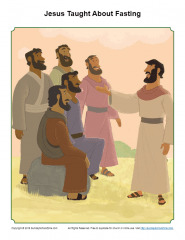 This Jesus Taught About Fasting Teaching Picture will help kids better understand that fasting is to be a private act, not something done for show. This teaching picture can be used in a Sunday School, homeschool or classroom setting. You can also see a list of the types of free, printable Bible activities we provide on Sunday School Zone.